The villa of doom is a small dark place. The Counterterrorists start outside the villa in a small garden. There are two ways to go: through the front door which leads directly into the mainhall or through a side door. There you'll find a kitchen and a dinner room from which you can go into the main hall or the cellar through a fireplace. The terrorist team has two different starting points. Either at the end of the main hall where there are four small rooms or in the cellar which is connected to the main hall through stairs. The map looks good, although there is nothing really astonishing about it. It's very dark so you better buy night vision googles. The r_speeds are very low. Teamplay is rather unimportant, cause the map is so small. Six would be the maximum player amount possible without a total mess. 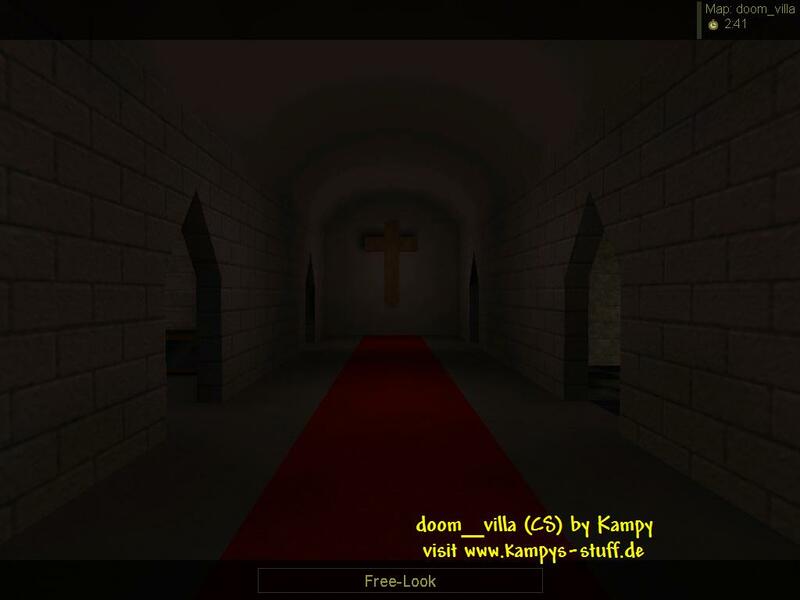 Believe me Ive played it with 20 strong Doom_Villa fans and it was the third world war. ;))) All in all it's a dark, small cs-deathmatch map with a cool atmosphere, but not much cs in it and some balance errors.